Ever since changing my in-depth topic to skateboarding, I’ve been pressured by the short amount of time I have left. There are less than two months until in-depth night so it’s been my goal to practice every day and get to a skill level I am happy with at the end. During my spring break in China, I didn’t anticipate the horrible WIFI at the places I was staying. Even with a VPN, I was unable to send any emails to Canada. My plan was to find a mentor by the end of spring break but now with the two-week setback, I’m even more concerned for my lack of time. Since coming back from China, I’ve contacted Zumiez, Menu Skate Shop, and a Poco Youth Skateboard instructor. I sent off mentorship request emails as soon as I returned home. After visiting the Zumiez store at the Coquitlam mall on Sunday, I talked with the store manager who received my email. He informed his employees about my request and unfortunately, most of them live in Maple Ridge which is inconvenient for regular meetups. He hasn’t talked to everyone yet but when he does or if anyone is interested, he told me ill be contacted ASAP. As for Menu Skate Shop, they are stationed in Gastown which I have been unable to visit during the past week. There has been no reply from them via email. 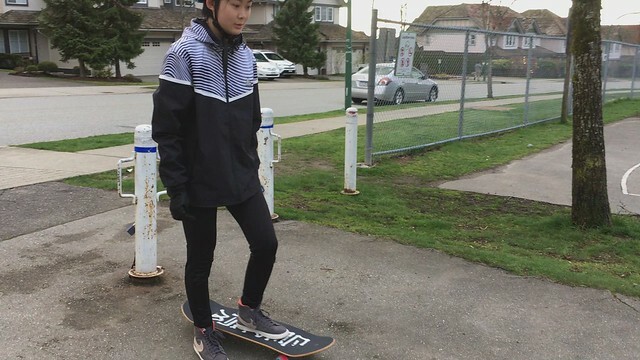 The Poco Youth Instructor is one of the skateboard program leaders at RailsSide Skatepark. As a volunteer for Port Coquitlam, it would be helpful if one of their staff were my mentor. My last option will be getting a private instructor and paying money for weekly lessons. If I still don’t have a mentor established by next week, then I will have to find an instructor. I purchased my skateboard in China and here are a few details about it. Take a look at my board in the videos below! 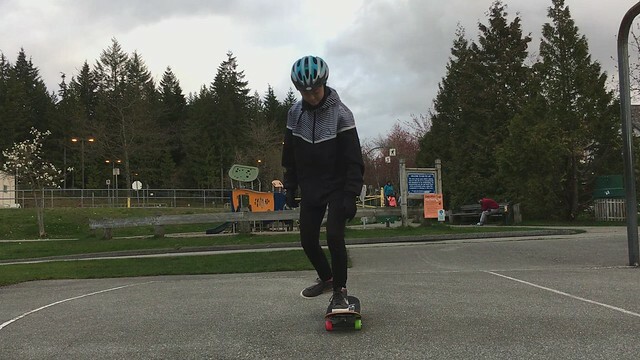 For the past week ever since getting back from spring break, I’ve been working on my balance and feet placement when riding. Being able to ride comfortably on a skateboard is the most basic skill I can work on by myself. Skateboarders are either Goofy or Normal. I am Normal, meaning my left foot is the front and my right is the back when riding forwards. My push offs have gotten a lot smoother and balanced since first starting. So far, Valerie has been providing great tips and feedback. Valerie: Your pushing is very good! As you progress, try to keep more of your weight on the foot on the board (left foot) when you take the other foot off to push (right foot). This allows you to go faster because sometimes when the weight is not being controlled by alternating feet, it can slow you down. The next step would be successfully executing a running start. despite my friend’s excited “ohh” this was still terrible and far from perfect. Kickturning is when you balance on your back wheels for a moment and swing the front of your board to a new direction. Valerie: It’s a light touch rather than a stomp. You just put pressure on the back foot to lift the nose (front) of the board up. But in terms of being more comfortable and fluid with it, you really have to move your whole body because if you don’t and only do little shuffles with your feet, it can lead to counter rotation. So after you lift the front of your board up a bit, initiate it with your hips and body rather than JUST the feet. It’s easier to rotate your body and have your feet follow in harmony than forcing it with only your feet. I still have a lot to work on with kickturns. From Valerie’s feedback, I will work on swinging my arms and moving my whole body when turning. 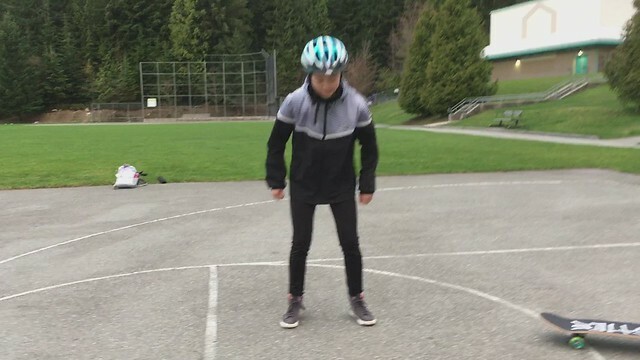 My goal is to be able to do a complete 360-degree spin on the back wheels. 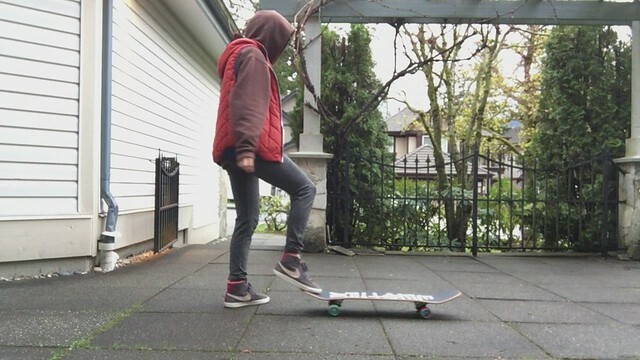 An ollie is difficult for beginners. 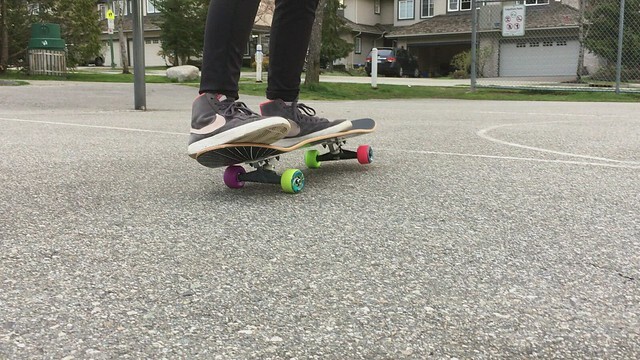 I am estimating at least a week of practice before getting used to the movement and timings of the trick. Next week, I will hopefully have a better video to show you. Without a mentor, I can unable to provide a conversation using the six hats. But to show my understanding here’s some of my own thinking categorized into the colours. While Hat: When going downhill, the only way I can stop is by falling/jumping off the board. Tail scraping is going to wear down the back of my board and if I use my foot to scrape the ground, the bottoms will get destroyed. Until I learn how to kickturn stop, I’ll have to make do with throwing myself off the board. Red Hat: Kickturns look so easy but why is it so frustrating for me. Black Hat: I either don’t lift the board enough or I lift it too much [when kickturning]. I have to find that “in-between”. Yellow Hat: Hey, at least I haven’t broken any part of my body. Blue Hat: I’ll work on my balance and foot placement on the grass first, then move onto cement. 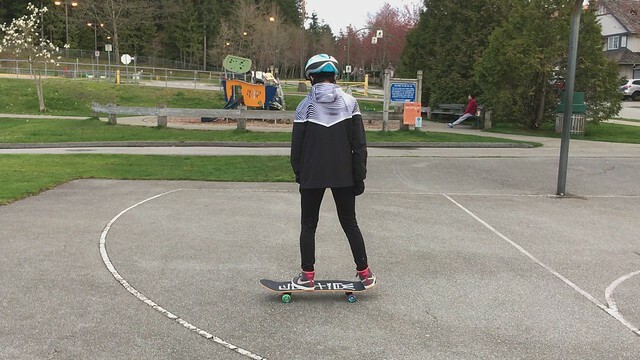 Skateboarding has been really fun I don’t regret changing my in-depth topic. My goals for next week are to perfect kickturns, try out some more easy tricks from YouTube, and to gain more confidence on the board. See you next blog post!